It’s been so hot here that I try to hose the horses down when I’m at the barn. Only Zelda really enjoys it. Curly will get a tiny bit wet, as will Freedom. Willow will have nothing to do with it. It’s been hot here. Up in the 90s almost every day. I tip my hats to my friends who are still taking lessons, still competing, and have lived to tell about it. I’m riding, but only in the early morning or early evening when the temperatures are a bit more forgiving. This weather reminds me of when I was a kid, at riding camp. As a New York City kid, the opportunity to spend eight whole weeks riding every day was about as close to nirvana as I could imagine. I certainly wasn’t going to let a little heat get in the way. 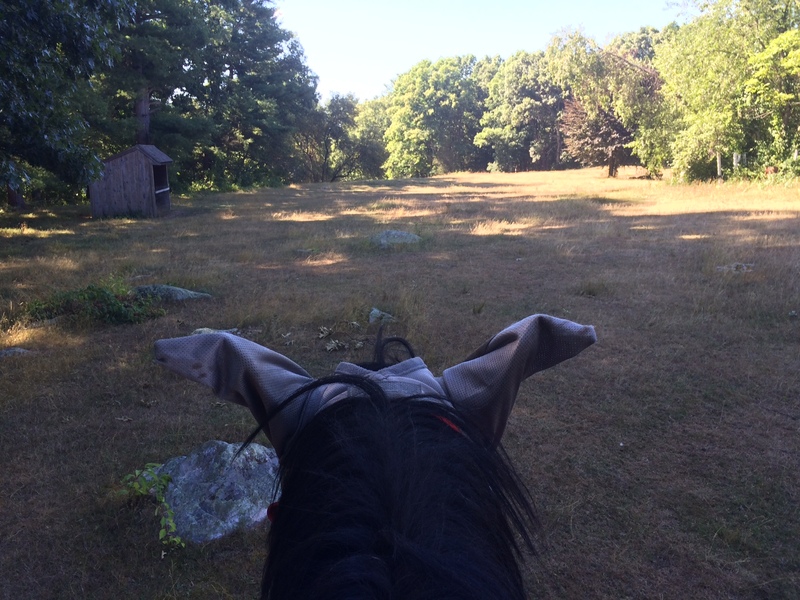 I restrict my riding to the shady areas of the field. It’s considerably cooler. You can see Zelda is outfitted with a fly mask, too. She’s a diva when it comes to bugs. As I recall, we rode twice a day — from about 9 a.m. to 11 and then again in the afternoons. There were no water breaks. I don’t remember ever being given even a sip of water during a lesson. In fact, kids regularly fainted, slipping off their horses or collapsing to the ground when dismounting. I never fell off my horse, but I certainly collapsed once I’d landed on my feet. As a parent, I can hardly believe that was the norm. Of course, we didn’t wear sun screen back then either. Instead, we were told to add a bit of salt to what we drank in the mornings. Sheesh. It’s lucky that no one suffered from real heat exhaustion. These days, I’m a wimp. I ride in the shade. I don’t ride very hard. I don’t ride very long. I have water at hand. And, I wear sunscreen. I don’t think either Zelda or Freedom mind taking it easy when it’s this hot. And at least Zelda really enjoys the shower after.